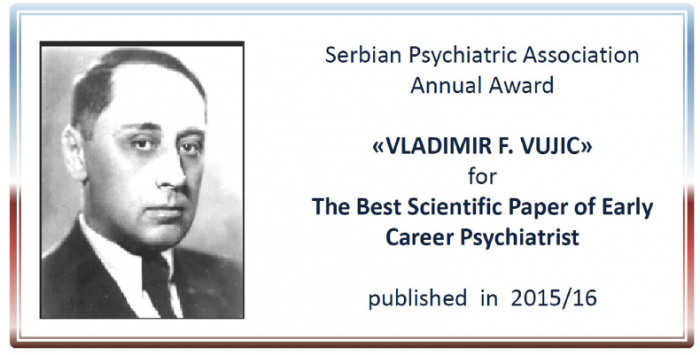 research in Serbian psychiatry and to highlight the values promoted by professor Vladimir F.
member of the Serbian Academy of Sciences and Arts. Vienna, where he worked in the research group of Nobel Prize winner Julius Wagner-Jauregg. neuropsychiatry in the country of his origin. “Vladimir F. Vujic” for the Best Scientific and Research Paper published in the previous year. (on 31 August 2016 and the last day in August every following year), residents of Serbia. 2015 to 21 August 2016.
place/certification of PhD status if the candidate is unemployed. 3. Short biography (200 words), with bibliography. 5. For unpublished articles attach the decisions of acceptance by the Editorial Board. Deadline for application is 1 September 2016. Psychiatric Association, 12-15 October 2016, Belgrade.